Before I began my journey through The Bible, which ultimately led me to a relationship with Jesus Christ, I’d heard of the Apostle Paul, but didn’t really know him. Which when I look back is surprising because I do carry his name. As my journey expanded and I began to read the Book of Acts I developed a real understanding of Paul and his mission. But I also began to see similarities in our journeys. Now understand I am in no way comparing myself to one of the greatest Apostles and leaders of the early church, but we both began as skeptics and fought the truth, until ultimately God brought us to the place He needed us to be. At this point you would think that Saul would’ve seen the err of his ways, but he didn’t. He continued to persecute the followers of Jesus, imprisoning them, or stoning them. How many early Christians were killed by Saul is a mystery, but after his conversion, it must have hurt him greatly. Have you heard the news? February is going to be a dry month! And no, I’m not talking about the weather… I’ve decided to clear my head and go dry for Feb! That means that for the full 28 days of February. In February I’ll be avoiding alcoholic beverages completely in support of the Canadian Cancer Society. I’m looking for donations to support the cause. Any donation is a good donation, so head to http://www.dryfeb.ca/users/paul-croft and send any spare change my way! Saul continued his persecution, and eventually went to the High Priests and told them he wished to travel to Damascus to bring the followers of Jesus there to justice. While on the road to Damascus, however, everything changed for Saul! A light appeared all around him, unseen by any one else, and a voice spoke to him asking “Saul, Saul, why are you persecuting Me?” (Acts 9:4) This was the voice of Jesus, and Saul now saw The Lord . He was blinded by the vision and led into the city by those around him, who had seen nothing but had heard the voice of The Lord. Saul, sight is returned by a follower of Christ who is told in a vision to seek out Saul. Saul’s name is changed to Paul, and his conversion is complete. The man who was one of the strongest opponents to the new Church, had now become one of its most ardent proponents. 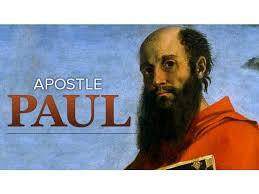 Paul travelled throughout the land opening new churches, preaching, and bringing others to God. But his biggest legacy is his writings. In the New Testament there are 27 books written by various authors (through divine inspiration), at least 13 of those books were written the Apostle Paul, and possibly 14 if he wrote Hebrews (which is disputed). Some of the verses written by Paul are the most quoted ever. His wisdom and understanding of the Scriptures is evident in everything he wrote. And his words of guidance are relevant even today in our modern world. To be named after the greatest apostle is a gift that I never really understood, until I read deep into The Bible. The Apostle and I took similar journeys of denial and opposition to God, but ultimately when God realized the time was right, He reached out to both of us in dramatic fashion. The Apostle’s words have lived on through over 2000 years and his legacy continues. After his conversion he brought Christ to the new world and preached until his death. He never allowed anything to get in his way, he was a true champion for Christ. If in my small way, I can follow in his footsteps, even just a little bit, then I know that God’s plan for me is at work.